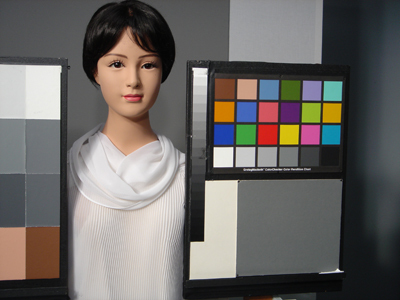 The “colour girl” described above is also known as “Shirley.” For this reason, the colour reference cards that typically depict a woman (or, more recently, women) are still referred to as Shirley cards. In her work, Roth explains how, until recently, there has been a light-skin bias embedded in colour film stock emulsions and digital camera designs. Getty’s Multiracial “Shirleys,” Dry Creek Photo Lab, 2004. – Lorna Roth. Forthcoming, 2012. “Surely, Shirley is no Longer the Ultimate Norm! ?” Postscript to “Looking at Shirley, the Ultimate Norm, in Ronald E. Hall, Ed. The Melanin Millennium. Springer Publications. – Lorna Roth. April, 2009. “Looking at Shirley, the Ultimate Norm: Colour Balance, Image Technologies, and Cognitive Equity,” in Canadian Journal of Communication. Vol. 34, No. 1, 2009: 111 – 136.